One in ten Briton’s own up to storing maggots, insects and even pets in their household refrigerators according to a new survey which has revealed we are a nation with very strange fridge habits. 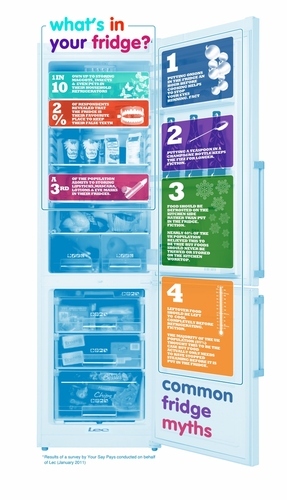 The research, conducted by leading refrigeration manufacturer Lec and illustrated as an infographic, also revealed that cosmetics and make-up were also common place in the fridge with over a third (34%) of the population storing lipsticks, mascara, lotions and eye masks amongst the milk and margarine. And that’s not all, with 2% of respondents revealing that the fridge is their favourite place to keep their false teeth, there could potentially be a whopping 1.2 million pairs of falsies chilling next to the cheese. FRIDGE FICTION: Over a third of us (37%) use this technique to keep our champers fizzy for longer but according to the New Scientist, who ran a blind test – one bottle with spoon, one without – this is fridge fiction. New Scientist measured the fizz rate per hour and both declined at the same rate. Truth is that champagne just keeps fizz longer than expected. FRIDGE FACT: More than a third of UK cry-babies believe that refrigerating onions will keep the tears at bay. And it’s true, it is thought that refrigerating an onion slows down the release of the enzymes that cause your eyes to water. FRIDGE FICTION: Nearly 40% of the UK population believed this to be true. In fact, foods should never be thawed or stored on the kitchen worktop. Perishable foods should be kept below 5 degrees centigrade if possible to reduce the growth of bacteria. When food defrosts, the outside surfaces rise in temperature whilst the middle remains frozen. The best place to defrost food is in the fridge where the food always stays at a safe temperature all the way through. FRIDGE FICTION: The majority of the UK population (85%) thought this to be the case but food actually only needs to have stopped steaming before it is put in the fridge. When food is left out to cool for more than an hour, the food temperature may be perfect for bacteria to grow. Place food in the fridge as soon as you can and NEVER leave out of refrigeration overnight. “It’s important to know your fridge facts from fridge fiction as storing food incorrectly could result in a very serious health condition. For example, many people believe you should allow food to cool to room temperature on the kitchen side when actually this actively encourages bacteria to grow. Dangerous toxins from bacteria, such as Bacillus cereus (found in rice) or Staphylococcus aureus (found on skin, noses and in throats) can develop as bacteria grow resulting in food poisoning. “Similarly, if you don’t store your raw meats or poultry carefully and correctly in the fridge (away from the risk of dripping onto ready-to-eat foods) you could put your family at risk of getting Campylobacter, Salmonella or E.coli. For more information about Lec and for stockists visit www.lec.co.uk or call 0844 81 53 737. This press release was distributed by ResponseSource Press Release Wire on behalf of Umpf in the following categories: Home & Garden, Food & Drink, for more information visit https://pressreleasewire.responsesource.com/about.